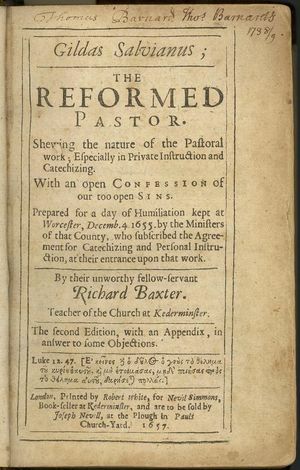 Naturally, such a practice was also very useful in spreading the teaching of the Reformers and correcting the practices they were purging from the Church. That, in brief survey, is what I could ferret out about the history of pastoral visitation. It’s hard to pin down the practice, which isn’t always described, but the overall path from Gospel-proclaiming to sin-confessing to Bible-teaching is a telling one. (2) Peter Y. De Jong, Taking Heed of the Flock: a study of the principles and practice of family visitation, Grand Rapids: Baker Book House, 1948, p. 21. (5) De Jong, p. 22. (7) De Jong, p. 24. (8) Andres Purves, Pastoral Theology in the Classical Tradition, Westminster John Know Press: Louisville, 2001, pp. 111-114. This entry was posted in Regular Posts and tagged Church, Pastor, pastoral visitation, pastors, Richard Baxter, Visitation on October 17, 2013 by revkamcclain.